Board Game Quest has posted up a preview of Frog the What Games' Slaughterball Kickstarter campaign (that's passed their funding goal recently, as well). I’m always curious what sports will look like in the future. Will we have robots as our competitors? Will they be violent bloodbaths where champions fight for our amusement? Or perhaps they will look a lot like today’s sports, but cybernetic enhancements. Regardless, today we are going to look at one man’s vision of our sporting future as we dive into Slaughterball. 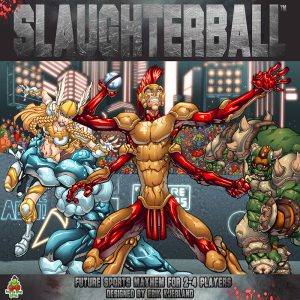 Now in funding on Kickstarter, Slaughter ball is a “competitive board game simulating a ferocious future blood sport where 2-4 teams of genetically engineered super-athletes clash in a remorseless steel pit.” So far I like the premise. The game also looks to have some great looking minis. But is it fun? Lets find out!